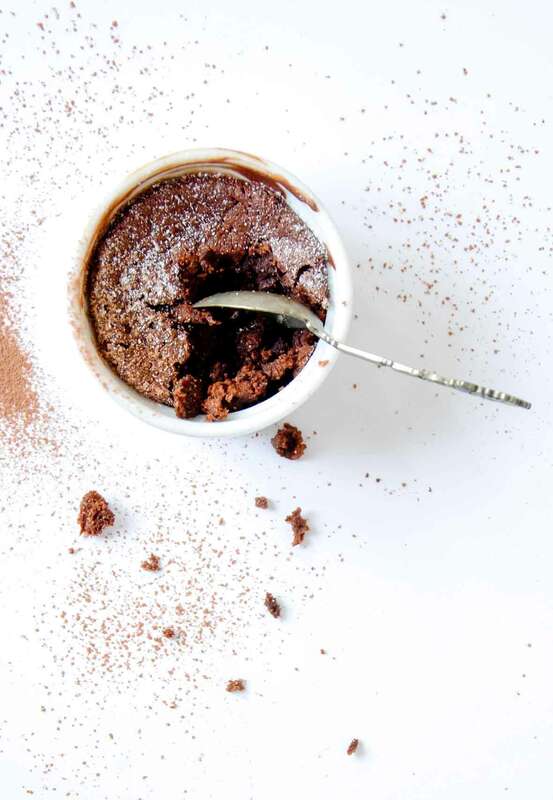 These double chocolate souffles from David Lebovitz are individual desserts that are incredibly easy to make from dark chocolate, milk, sugar, whiskey, and eggs. Simple and sophisticated. 1. Butter six 4-ounce ramekins or 6-ounce custard cups. Place them on a rimmed baking sheet. Preheat the oven to 400°F (205°C). 2. In a large heatproof bowl placed over a pan of simmering water, heat the 5 ounces chopped chocolate and the milk until the chocolate melts. Do not let the bottom of the bowl touch the simmering water or the chocolate may scorch. Remove the pan from the heat and whisk in 3 tablespoons sugar, the whiskey, and the egg yolks. Let cool to room temperature. 3. In a clean, dry bowl, beat the egg whites with an electric mixer on medium speed until they’re foamy and begin to hold their peaks when the beaters are lifted, 3 to 4 minutes. Gradually beat in the remaining 3 tablespoons sugar, beating until the whites form soft, droopy peaks. 4. Using a spatula, gently fold the beaten egg whites into the chocolate mixture, mixing until the whites are almost completely incorporated and almost no trace of white remains. Fill each ramekin or custard cup halfway with the soufflé mixture. Sprinkle with the coarsely chopped chocolate or chocolate chips. Add enough of the remaining batter to fill each ramekin or custard cup almost to the top. 5. Bake for 14 minutes, or until the soufflés appear firm yet are slightly jiggly when nudged. They should be very soft when you remove them from the oven. Serve immediately, with a dusting of confectioners’ sugar or cocoa, if desired. This is a delicious, very light, mini soufflé. The crust has a slightly crisp cake-y-ness but is still soft and delicate. The center is foamy and gooey. When taking a spoonful it feels like the whole thing will collapse into a puddle, but somehow the soufflé manages to hold itself up. If you're looking for something that's like a light, foamy mousse in texture and full of chocolate, this is it. Making a soufflé can be intimidating if you've never tried it, but it's not as scary as it might seem. The first time I ever made a chocolate soufflé I swore I was done for good. The recipe I used called for several more ingredients than this one. Not to mention the unnecessary number of steps involved. None of that is needed and this recipe proves it. I used Callebaut 54.5% chocolate and the soufflés were not too sweet at all. I didn't have whiskey so I used Cointreau instead because I love chocolate and orange together. Honestly, I think it got lost because no one picked up on it. Next time I will try using strong coffee or splurge on a small bottle of whiskey. While the chocolate was melting I separated the eggs making sure no yolk got in to the whites. If this should happen, save them for an omelet and start over. The whites will not whip properly. While the chocolate was cooling I moved to the egg whites. It is important that your bowl is clean and dry. Once the whites were frothy I started to add the sugar in very slowly as this is the method I have always used. Don't over whip them or you will have a hard time incorporating them in to the chocolate. I added the Cointreau, sugar and yolks to the chocolate and mixed well to combine. I used a large rubber spatula to incorporate the whites in to the chocolate mixture. Using gentle, folding strokes and scraping the bowl in between folds helps to eliminate streaking and over mixing. I used 4 ounce ramekins so it was easy enough to use a 1/4 measuring cup to fill halfway, add the additional chopped chocolate then a scant 1/4 cup to fill the rest of the way. While they were baking I had enough time to get my serving plates ready. I placed them on a serving tray next to the stove. Once I pulled the soufflés from the oven I quickly, but carefully placed them on the plates, added a few raspberries and served immediately. The only downside to any soufflé is it must be served immediately because they will collapse. I timed these and it took a good 5 minutes for them to completely collapse. But, just because they are collapsed does not mean you can't still serve them. They might not look as pretty but they will still taste good. You can also add powdered sugar as long as you have it ready to sift on top. My guests were so impressed and everyone devoured every bite. The recipe is easy to follow and it came together quickly. They were light and airy and the extra chocolate in the middle added a bit of creaminess and a punch of chocolate flavor. I will definitely experiment with the addition of whiskey and other flavors. I had never made a soufflé' before. And I was excited and mildly intimidated making these. This recipe was incredibly easy to follow. (I had been vegan for 30 years and only began cooking with dairy and eggs in January.) And the end result was divine. The recipe yielded 6 soufflés and I had not thought about the fact that they need to be eaten right away. So my husband and I were "stuck" eating multiple decadent, moist, luscious soufflés. (The things he does for me...) I will absolutely be making these for my next dinner party. These chocolate soufflés were delicious little puffs of chocolate and a very nice way to end a special dinner. I used semisweet chocolate and vanilla extract. The recipe called for chocolate chips or chopped chocolate to sprinkle in the middle of the batter. I used Saco brand chocolate chunks. They were slightly larger than chips but similar in size to chopped chocolate. They completely melted in the finished soufflés. I'm not sure if this was supposed to happen. I was expecting there to be some solid chocolate bits left. I baked the soufflés for the 14 minutes called for. Mine came out a little moist in the middle. Next time I'll leave them in a bit longer. Also a sprinkle of confectioners' sugar would finish the soufflés nicely. The only drawback, as with all soufflés, is that they have to be served immediately. They do deflate quickly. Double Chocolate Soufflés Recipe © 2004 David Lebovitz. Photo © 2004 Christopher Hirsheimer. All rights reserved. All recipes and photos used with permission of the publisher. I’ve been wanting to try to make a souffle…do you think it would be OK if I prepared it before dinner, but didn’t bake it until a couple of hours later (after dinner)? If that would work, should I leave it at room temperature or put in in the refrigerator until ready to bake?